Many projects in the field of high current accelerators require high intensity beams of light ions (protons or deuterons). All these machines, whether currently under construction or in the design phase, require a reliable ion source capable of generating intense stable beams of excellent quality. Past development projects have demonstrated the capability of SACM in the design and construction of operational positive ion sources capable of meeting the desired specifications. These excellent results have led to the CEA being chosen to construct the ion sources for the SPIRAL2 and IFMIF accelerators. Cross-sectional view of the ALISES source. 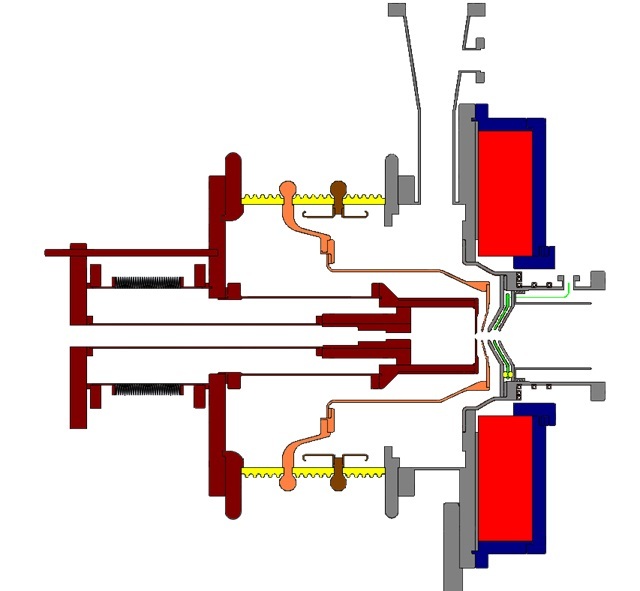 Shown in red: The short solenoid adjacent to the extraction zone that generates a resonance in the plasma chamber. Development work must continue in order to carry on making improvements to the optical quality of the beam from these sources, including reducing divergence and emittance. One of the points requiring a deeper understanding is the coupling between the microwave radiation and the plasma. Progress in these fields is being made using the Platform for Research and Optimization of Intense Beams of Light Ions (PROFIIL), together with the BETSI ion source test and research facility, which has been producing and analyzing intense pulsed and continuous beams since 2006. The ALISES source installed on the BETSI test facility. More recently, the new Advanced Light Ion Source and Extraction System (ALISES) has been developed. This source consists of a single coil referenced to the laboratory potential and has produced encouraging results in terms of the microwave power efficiency, as it can be started with less than 60 W of RF power. 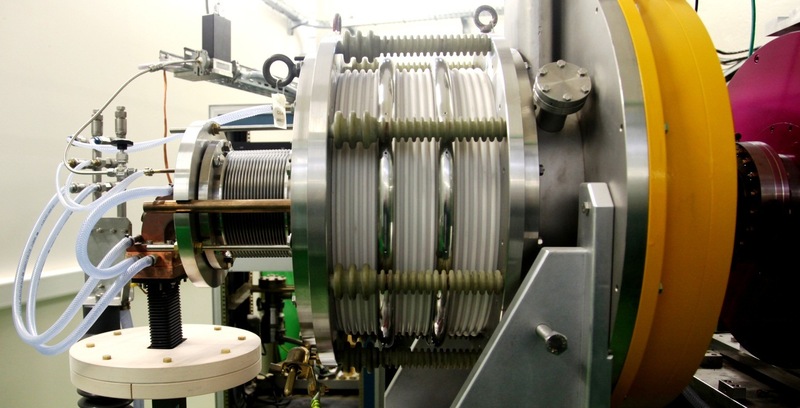 This R&D source has been used to test a number of parameters including the influence of the length and radius of the plasma chamber on the production of light ions. The tests were carried out by a PhD student using the BETSI test facility. The large quantity of results has led to the publication of scientific papers and a CEA patent. Some of these results have indicated that it would be possible to adopt a smaller plasma chamber, raising the possibility of a miniaturized ion source. It should also be possible to optimize the coupling between the microwave radiation and the plasma, thereby reducing the required RF power.